What Causes Delayed Tooth Eruption in Children? Brenna Davis is a professional writer who covers parenting, pets, health and legal topics. Her articles have appeared in a variety of newspapers and magazines as well as on websites. She is a court-appointed special advocate and is certified in crisis counseling and child and infant nutrition. She holds degrees in developmental psychology and philosophy from Georgia State University. When children's permanent teeth come in substantially later than average, it is called delayed tooth eruption. In "Factors Influencing Permanent Teeth Eruption," Ruta Almonaitiene, et al. argue that delayed tooth eruption does not normally indicate a medical problem. Instead, numerous sociological, lifestyle and genetic factors affect when a child's permanent teeth arrive. Almonaitiene, et al. do note that extreme delays in tooth eruption frequently do indicate an illness, so if you are concerned that your child's teeth have not yet arrived, consult your dentist or pediatrician. Genes play an important role in numerous developmental factors, including tooth eruption. Some children's genes may tell their permanent teeth to come in later than other children. If you began losing baby teeth late relative to your peers, odds are good that your child will as well. The teeth of malnourished children erupt later than those of their peers. In the industrialized world, the overwhelming majority of children are sufficiently nourished to develop normally. 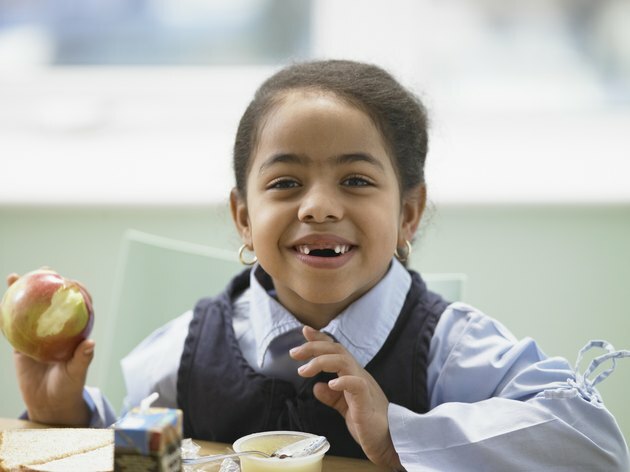 If, however, your child is an extremely picky eater, her nutritional status may affect permanent tooth development. Socioeconomic factors also play a role in tooth development. Children of poor parents tend to develop teeth later than children of middle class and wealthy parents. This is likely due to subtle differences in nutritional quality, environmental toxins and stress. Most parents know that girls begin speaking and enter puberty more quickly than boys. Girls also develop permanent teeth slightly earlier than boys. On average, girls begin losing baby teeth four to six months earlier than boys. Larger children tend to develop teeth earlier than smaller children. Additionally, babies who were born prematurely or were small for their gestational age develop permanent teeth later than their peers. In rare cases, delayed tooth eruption may provide the first indication that a child is ill. Hormonal factors play a strong role in tooth development, so children with pituitary or thyroid problems frequently develop teeth late. Jaw malformations and mineral deficiencies can also delay tooth eruption. Parents should not be concerned about a child who develops teeth slightly later than her peers. If, however, your child has not begun losing baby teeth by age 7 or 8, consult your pediatrician. What Causes Black on Childrens Teeth? Can Children Still Be Teething at 4 Years Old? Which Baby Teeth Do Children Lose?